Women’s Wedding Band, also called Women’s Wedding Ring, is a finger ring that implies the wearer is married. The original culture of wedding bands is from ancient Egypt, dating back to 6000 years ago. Wedding Band is a circle which has no beginning and end, bride and bridegroom will exchange their wedding bands on wedding ceremony. It symbolizes the perpetual love of the spouses. The wedding band often is worn on the fourth finger of left hand, it is said that this finger enclose a special vein that is connected directly to the heart, but others focus on the right hand. Convention varies elsewhere all over the world. All jeulia women’s wedding bands are from famous studio and 100% handcrafted. 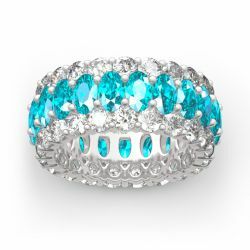 We have developed the neoteric style on the basis of the original circle and combined aesthetic with women’s wedding bands. Now jeulia women’s wedding band is not a monotonous “love circle” any more, but a chic spiritual jewelry for your love.